If Deadliest Catch, Wicked Tuna, and Cold Water Cowboys are on you nightly channel surfing list; follow this Blog and my social media over the next few months. I am not a stranger to the commercial fishing industry. Over the years I have found jobs over seas off the coast of Scotland in the North Sea, and back in Canada on The Bay Of Fundy in Nova Scotia. Now after several seasons of chartering my own boat in The Bay of Quinte and Lake Ontario, I am preparing to head back into the commercial side of things for Spring 2015 and hope you will follow me there (online of coarse). Have you ever thought it would be cool to land a commercial fishing job when watching extreme fishing shows? Get ready to experience what it is really like to become a deckhand on a commercial fishing vessel and watch/read my real life interpretation of our favorite reality shows. Last week I wrote a blog about choosing your Rods, reels, and line. On Friday I attended a seminar that was open to the public at Pro Tackle, A Local Tackle shop in Belleville. I was happy to see a decent turn out for this event as I believe it was the first of its kind for the store. Local guides were on hand doing the seminar, and an Okuma Pro Staff Member. I believe these 2 guys need a bit of recognition here. It was obvious that the 2 guides felt right at home talking techniques, gear selection, and even proper etiquette at the ramp and on the water, as the seminar went on for approx just shy of 3 hours, as a professional guide on Quinte I run some of the same area’s that these guy’s do and was amazed at the amount of detail and information these guys were willing to give away. I could tell with some of the questions being asked that the 2 were a bit hesitant at first, but never the less they still told trade secrets about equipment, placement, tackle, and yes even spots that they and other people I know personally and even I myself frequent LOL. After the Seminar the 2 guides and the Okuma pro staff member, and the owner of the store, stuck around to answer all of the questions everyone had. Also Pro Tackle had a free BBQ for all that showed up. I felt it was probably one, if not The BEST Walleye seminars I have ever attended personally. I am going to touch base on one of points in this seminar that I thought was a great topic. Last week I talked about choosing your Line counter reels, but I did not touch base on what to do immediately after you have chosen one for your specific needs, before you take it on the water. I always knew that calibrating reels was extremely important, however you should do this fairly often. In recent blogs I mentioned that when you buy specific baits no matter what it is that there is a chart that sometimes comes with the lure in the package or you can find on line, or if you have a smart phone then you can download an APP which will tell you the dive curve for just about any lure on (or off) the market today. I have to admit that calibrating my reels have been put off for some time now so right after I was reminded at the seminar the next day I took all my reels and found that over half of them were way, way off the mark, most of my reels didn’t have enough line on the reel for it to even be close to accurate, and even one of my reels were broken beyond repair, this Just after I posted in my last blog to remember to maintain your equipment, I have no idea how long I’ve been carrying around a broken reel LOL. Anyway, besides being able to accurately place your baits as per manufacturers specks, there are other reasons you should be calibrating your reels, if you have some other friends on the water and either you or they call, text, or radio each other to let one another know a set up that has been working that day, what if one of you have a rod that has been going off like crazy, you are going to let your buddy know your presentation and how much line you have out behind the boat right? Well if either one of your reels has not been calibrated then you are going to put out what you think is the correct amount of line due to your friends information, and really you will either have too much line out or too little. 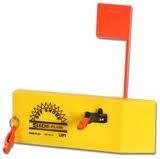 This equates to your buddy having a great day on the water and you think he is pulling a fast one on ya. So I strongly suggest before your next trip out you take the time and do yourself a favor and possibly even save a friendship, and calibrate your lines. as soon as you pick up a new reel no matter what the make, sometimes the store you buy it from will spool it for you free of charge. I just came across this the other day with a good friend of mine, since I was calibrating all of my reels I asked if he wanted his done as well, his answer to me was no I just bought it and the store did it for me. I asked him in shock, they Calibrated the reel for you? I was curious because I have never bought a reel and had the store offer to calibrate a reel for me. He said well they are the ones that put the line on it. I tried to explain that putting line on the reel and calibrating it were 2 different things so now when he asks me for information on the water and if I tell him, he may not put out the right amount of line, or if he tells me a set up at least I know ahead of time I won’t be able to replicate it lol. How to calibrate a line counter reel. First you will need 2 or three pegs to stick in the ground (or something that can mark the ground), a clip to hold your line to the pegs, A Tape measure, (you don’t have to but a Tape that has 100 linier feet on it would be the most accurate), Something to mark your reels with ( either painters tape or a marker), and a Perminant Marker. Make sure to spool your reels until they are full then take the following steps. 1st measure out 100 feet, with tape measure. Stake ( or mark) the ground at either end. 2nd clip your fishing line to the peg in the ground. Do NOT cut your line off the spool yet. 5th release the line but keep some tention on the line with your thumb as you walk over to the 2nd peg 100 feet away. 6th read the line counter, what does it say? Repeat steps 1 through 7 until your counter is exactly on the 100Ft mark. You can also look up on Youtube to see how this is done. I hope this was helpful and Tight Lines. I find that there is some equipment that is essential for consistently catching walleye year round. as I have blogged about this, this past spring I will go into another explanation about it now. 1st you must select a rod with good back bone, and it must also be quite flexible. 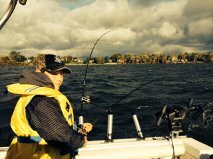 if you are going to be going after walleye in the spring and the fall on Quinte you must have a rod that can handle large walleye. 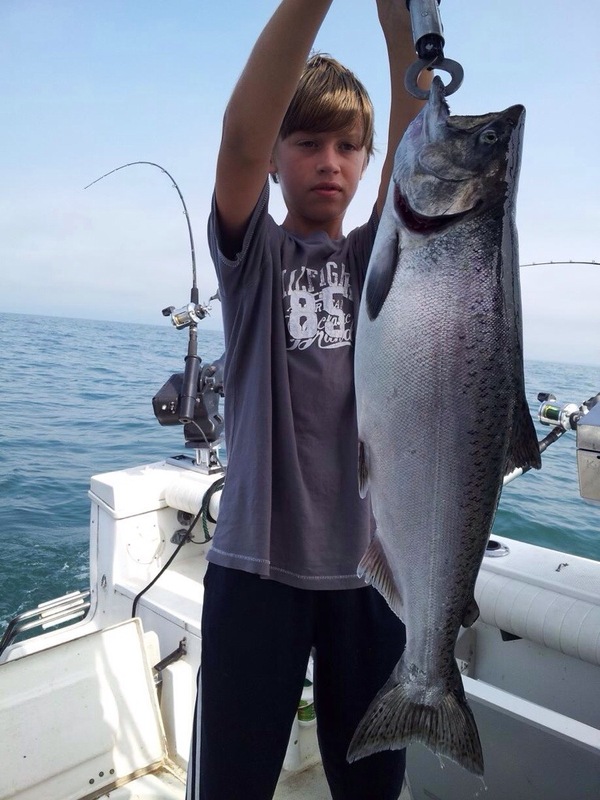 these fish can be in the 10 + lbs range and they can be very strong if you have a rod that is too lightweight it may snap under the pressure of the fight alone. There are many methods used to catch these fish. From down rigging, and Dipsey Divers, to line weights and Planer boards. All of these methods used, put a colossal strain on your rods and equipment even on the calm days, but especially in rough weather so you must have a rod that can take the abuse for hours on end, and day in and day out. 2nd To Match the rod strength you must have a line counter reel. when choosing a line counter reel make sure you do some research on these. Most importantly when choosing a line counter reel make sure you get one that has a good strong gear, and drag system and that can hold enough line for your fishing applications. remember using lead-core line will require a much bigger reel to put enough line on it than if you are just putting 10lbs test Braided line on a reel. Also when choosing a reel take into consideration what time of year you will be fishing and in and what body of water, This is so you choose one that will be perfect for your situation. and Lastly make sure the counter has a loud enough clicker on it so you will hear it in all kinds of situations when you have a fish on the line. Line counters are imperative to your success because it is the only way you will be able to perfectly replicate a presentation to the fish when you find something that is working. A small tip when you do find one make sure you lock-tight any screws that are not meant to come off the reel I have had several different types of reels where the release clips and other screws have suddenly disappeared. Off topic but Maintenance on your equipment is so essential, you do not want to find yourself hours away from home out in the middle of the lake, to find your equipment is not working properly. 3rd Fishing Line. after you have chosen a good rod and reel combo its time to choose the line that will 1st, work for the fish you are going after and 2nd, be able to take the abuse, and wear and tear you will be putting it through. for example if you plan of attaching weights to your line it must be thick enough to be able to hold them securely and if you plan on using planer boards and Dipsey Divers it must be strong enough to be able to withstand the tension of constant pressure from the resistance of the boards against the water. Also choose a line colour that makes the line invisible in the water you are fishing in. A good start in finding a good line is to use a 20-30lbs braided line. on most of my rods I use Power Pro 30lbs test at the moment when I am fishing walleye, I put a 10-30 foot 17lbs fluorocarbon leader on them, however I am thinking of trying a 12lbs fluorocarbon leader material and recording the results. I hope you find this useful when deciding what type of rod you need for fishing walleye this Fall. Time for The Bay Of Quinte Fall trophy hunt. Well its that time of year again where trophy walleye make their journey into the Bay Of Quinte from their summer homes in the big water of lake Ontario to their winter ones in The Bay Of Quinte. Each Fall huge Walleye migrate to their staging areas throughout The Bay Of Quinte where thousands of anglers flock for their chance at trophy Walleye. 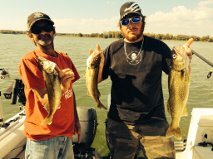 These fish are commonly caught in the 2 to 5 lbs range (as shown in pic from yesterday) throughout the summer months however when the fall comes and before the ice forms there is a short period of time maybe a month to a month and a half where 8 to 10 lbs walleye are common and you can even find them in the range of 14 and 15lbs plus during this time. The Later in the season and as the water surface temps drops to just above freezing is where you’ll find locals, Guides, and people around the glob in search of those elusive world renown trophy Eye’s. Yesterday I was out scouting with a couple of friends in the Bay and although we did see some huge hooks on my electronics we were unable to entice anything considered to be a trophy to bite. Marking fish like we did yesterday only got us excited because that is a sure sign that the fall hunt will soon be in full swing. As the temperatures drop its time to put away those worm harnesses and start using those deep diving crank baits trolled with lengthy leads behind your boat, or is it? for those people that maybe would like to try their hand at these fall beauties but don’t want to spend a fortune doing it there are many devices and aids sold on the market today to help get smaller lipped baits and spinners down deeper with less bulk in the water, helping not to spook the fish, the result is that you can use some of the baits you used all summer in the shallows now to fish the fall walleye that like deeper water. Of course those big lipped baits work great and have done for some time but if you don’t have money to burn and don’t want an entirely new stock of lures then try looking into some of these devices it might save you some cash? more to come on fall walleye tactics soon.